Kevin Zussman is a Vice President at Cultivian Sandbox. 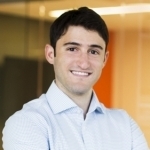 Prior to joining Cultivian Sandbox, he was an investment banking analyst at Baird. Kevin holds a BBA with emphases in finance and accounting from the Ross School of Business at the University of Michigan and a minor in environmental science.